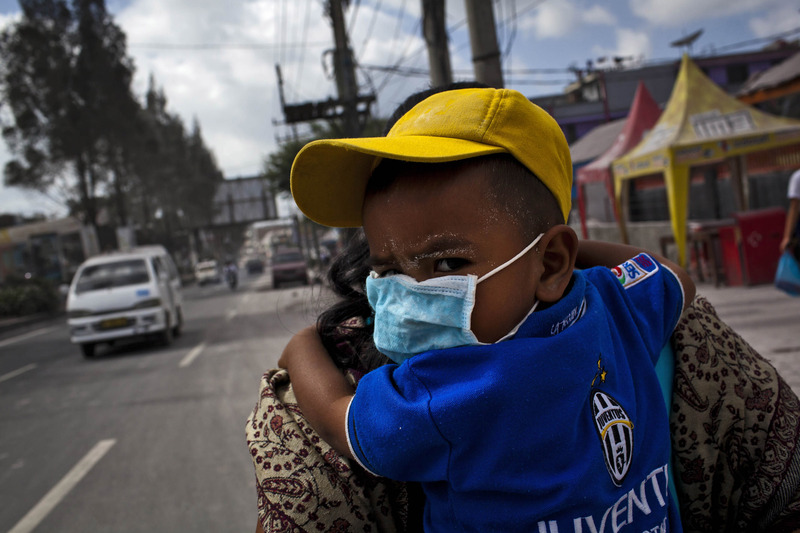 A boy wearing a mask is carried through an area covered by ash after Mount Sinabung erupted spewing volcanic materials at Berastagi village in Karo district, North Sumatra, Indonesia. Mount Sinabung, which has been intermittently erupting since September, erupted eight times in just a few hours on Sunday. Officials have reported of rocks raining down over a large area, forcing thousands to flee their homes. The Indonesian government has called for people living within five kilometres (3.1 miles) of the volcano, on the northern tip of Sumatra Island, to evacuate their homes as the volcanology agency raised the alert level for the volcano to the highest point on a four-stage scale. By Ulet Ifansasti/Getty Images.